Simulation of stress on a manifold part. Simufact Engineering has launched Simufact Additive software for the simulation of metal additive manufacturing processes. 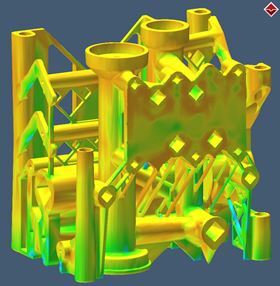 The software can simulate all key AM process steps starting with the ‘printing’ of the part, followed by heat treatment, cutting the part off the build plate and removal of support structures, plus heat and pressure combined processes, including hot isostalic pressing (HIP). The current version of Simufact Additive can predict the final distortion and residual stresses of metal 3D printed parts. The modelling is carried out using CAD data in Graphical User Interface (GUI) environment aligned with the real process work flow. The software helps to compensate the distortion, minimize residual stresses and optimize the process parameters. This story is reprinted from material from Simufact, with editorial changes made by Materials Today. The views expressed in this article do not necessarily represent those of Elsevier.